At a time when the entire publishing industry is undergoing a sea change as the relative merits of digital and print media sort themselves out, there are certain books that will be unaffected by the turmoil. 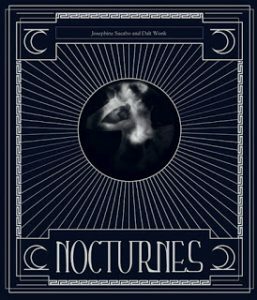 Nocturnes, a large format volume of Josephine Sacabo’s photogravures accompanied by Dalt Wonk’s poems, is a classic example. The reason is simple. As a beautifully produced limited edition it is something of an art object in its own right, a collectible that, while pricey, is still affordable to anyone who truly wants one. In it, Sacabo’s stunning images appear as mysterious, even romantic, paeans to the power of dreams, darkness and the lunar light of the psyche. Dalt Wonk’s deftly evocative poems, each printed on translucent vellum, segue seamlessly into her haunting visions distilled from the raw materials of her long personal history in the French Quarter, southern France and Mexico, as well as her lifelong immersion in the works of great artists and thinkers through the ages, from Rainer Maria Rilke’s poems to Gaston Bachelard’s philosophical ruminations on reverie. And for that we should be grateful. As longtime New Orleans residents, Josephine Sacabo and Dalt Wonk epitomize the creativity and originality for which this city has historically been known.